Dacia unveiled yesterday the Duster concept car in Bucharest, having introduced it to the world at the Geneva Auto Show, Agerpres informs. 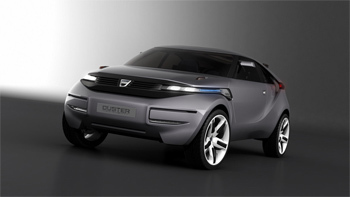 The Duster model was unveiled by Patrick Lecharpy, Design Amont Renault Director. The cross-over Duster was designed by Renault Design Central Europe in Bucharest in co-operation with Renault design Technocentre from Guyancourt, France. ‘The main features of this concept car are its habitability, robustness and simplicity. It has a spacious, comfortable, practical and simple interior design. We have developed this model for Romanians who spend their week-end in the mountains or at the seaside,’ said Patrick Lecharpy. ‘The Dacia models need promoting worldwide because they are a brand of Romania. The Royal House can be present for Dacia promotion events, but cars are best promoted by their own value,’ said Princess Margareta of Romania, who attended the launch of the concept car. The car was very well received by the public at the Geneva Auto Show where it was unveiled, according to Antena3.ro. However, Dacia Duster will always be a concept car and will never become reality, say Dacia-Renault officials. ‘Dacia Duster is a concept car and so will remain, it will never enter mass production. However, some of its features will be found on the future Dacia models,’ Francois Furmont, Dacia-Renault CEO, stated at a press conference a few days ago. Dacia will continue to expand its range of models after the launch of the sixth passenger vehcile of the Logan programme  the Dacia SUV, Lecharpy noted. According to Dacia-Renault officials, the Duster concept car is the result of the efforts of the Renault Design Centre opened in Bucharest last year, being a design exercise through whish Dacia demonstrated ‘it can make pretty cars’, Antena3.ro informs. The new generation of Logan will be made up to 75 per cent in Romania, after Sandero, that is a 40 per cent Romanian made vehicle, said Renault Technologie Romania CEO, Philippe Prevel, quoted by Agerpres. Seen from the driver’s side, Duster is a sports coupe. From the passenger’s side, Duster is an MPV with two doors opening in opposite directions. The car is 4.25 m long, 1.64 m wide, 1.49 m high and weighs 1,300 kg. the 1.5 dCi 105 HP (77kW) engine is fitted with a particulate filter, the fuel consumption is limited to 5.31 L/100 km and the quantity of emissions is just 139 g of CO2/km. Duster can reach 100 km/h in 9.6 seconds, has manual transmission with six gears. The driver’s airbag is located in the lower side of the wheel. An electronic display is situated centrally on the dashboard, according to Antena3.ro. The French Group has inaugurated in Bucharest a design centre for the Renault and Dacia brands, the sixth centre of its kind for the French producer, with the first vehicles designed in Romania set to be launched in 2011, Rompres informs. According to Patrick le Quement, by locating the design centres in several areas of the world, the company takes over the ‘local tendencies’ when it comes to design. The French Group has announced at the end of 2006 that it will bring to Romania the entire car manufacturing process, including the research and design part. The research will take place within a centre in Titu locality, Dambovita County, the investment being estimated at EUR 450 M. The centre will include a test track for multi-brand vehicles, a car engineering department, a centre for mechanical testing and information technology, accounting and client monitoring departments. The centre will be inaugurated this autumn. Two weeks ago, the French Group opened a car gear box plant in Mioveni, a plant for which it initially earmarked EUR 146 M. The French producer has invested more than EUR 1.2 bln in Romania from the moment it took over Dacia and up to last year, with EUR 600 M set to be added to that sum in the following three years. For that Renault has used the cheap labour force in Romania at its fullest. An even more important factor was localizing the plants as close to the sale markets as possible in order to reduce as much as possible the distribution and delivery costs. ‘The Economist’ praises Logan’s performances. Thus, in an article entitled ‘The logic of the Logan’, the British journalists comment on the surprising success that the vehicle produced by Dacia under Renault’s management has registered on Western European markets, the Money Channel informs. ‘The Economist’ also writes that the company’s profit margin for the Logan brand surpasses 6 per cent, twice larger than the rest of the vehicle brands produced by Renault. According to Gerard Detourbet, the head of the Logan project, quoted by ‘The Economist’, the success came at a time when the buyers have started to be more indifferent to the product’s country of origin. In the European Union and northern Africa the car was listed as a Romanian Dacia sold by Renault dealers. The Renault representative points out that most of the French clients know that the model is produced in Romania but their decision to buy it takes into account its price. In France, the second-hand vehicles’ market is the most important competitor for Logan, ‘The Economist’ goes on to say. ‘Once the production parameters that Renault has set for itself, namely close to one million units per year, have been attained, we will be the country with the largest production in South-East Europe when it comes to vehicle manufacturing. Once Ford comes in we will end up being the most important producer country in Central and South-East Europe’ Tariceanu has stated Friday during the inauguration of the design centre in Bucharest, the Money Channel informs. The Prime Minister has stated that if in the case of Renault availability has existed, in the case of PSA Peugeot Citroen auto Group the answer has been ‘overall negative’. Dacia Logan SUV will look very good and will have all of the top technical characteristics, Patrick le Quement, industrial design director within Renault, has stated recently, Rompres informs. The Dacia SUV series model will most likely be launched at the end of 2009 and will be the sixth model in the Logan series, after Logan Sedan, Logan MCV, Logan Van, Logan Pick-Up and Sandero, the latter set to be launched in Romania on June 3. The Renault representative has stated that the technical platform on which the Logan models are developed is very flexible and offers a lot of expansion opportunities towards most of the vehicle classes demanded on the market. In what concerns the new Sandero model, Patrick le Quement has stated that this is a hatchback model characterized by durability, but not as sophisticated as Renault Clio III, although there could be a slight ‘cannibalizing’ of sales as happened previously on emerging markets in the case of Dacia Logan and Renault Clio Symbol. The first Renault prototype to be created and developed entirely in Romania, presented at the opening of the Renault Design Centre in Bucharest, is an improved Logan Pickup that reminds the Dacia Pickup with the special bodywork, Rompres informs. “Romanians are highly attached to the Pickup, and this model enjoys a great popularity all over the world, therefore it was adequate for an initial concept,” Patrick le Quement said. He mentioned that the project of the group of products that will replace the current Logan offer is already initiated. Institutions working for this project include not only the Design Centre in Bucharest, but also Technocentre Renault and the Design Centres in Brazil and Italy.